We’ve said it once, we’ll say it again: the Boxster and Cayman have come a long way since their introductions back in 1996 and 2005, respectively. Going from somewhat uninspiring competing with a family of 23 911 variants, to a lighter, faster, more robust next-generation redesign for 2018 with the 718. 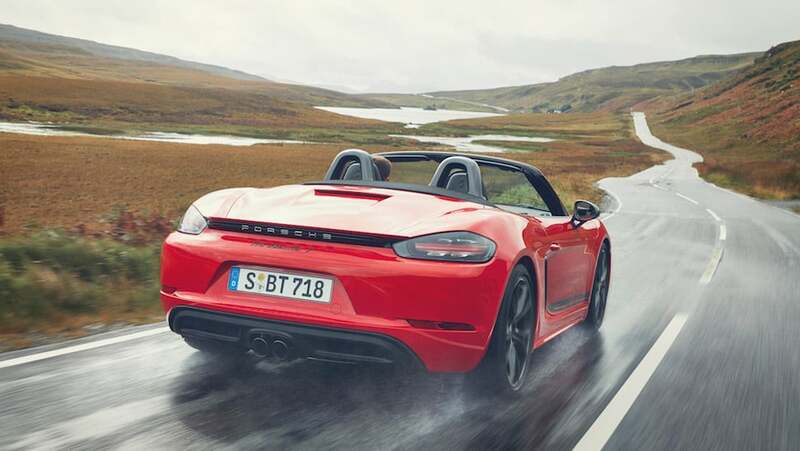 Staying on course, Porsche has taken these entry-level mid-engine rockets to new heights with the 718 Boxster T and 718 Cayman T, giving the pair the Touring treatment transforming them into true drivers’ cars – similar to what they did with the new 911 Carrera T by eliminating the heavy stuff while adding some performance parts rendering into a well-balanced drivers’ coupe. It’s all about the driving dynamics with the new model, including the PASM sports chassis lowered by 20 mmm paired to 20-inch alloy wheels, all offered with the 2.0L turbocharged engine for the first time in this range. The gearshift is shortened and PDK is optional. That’s right, this means you’re getting six-speed gearbox and Porsche Torque Vectoring (PTV). Styling-wise, “718 Boxster T” or “718 Cayman T” logos on the sides, paired to Agate grey mirror shells, and centrally positioned sports exhaust with black chrome-plated twin tailpipes separate these two from the pack. Hitting a top speed of 275 km/h and sprinting zero to 100 km/h in 4.7-seconds, 2.0L four-cylinder turbo engine works in conjunction with dynamic gearbox mount minimizing vibrations in the engine/gearbox area while reducing movements that could affect driving dynamics as a result of the total mass of the drivetrain. Porsche enthusiasts can be a tough crowd but the well-balanced 718 T variants won’t give them anything to gripe about.